Applications may be submitted either through on-line or off-line with effect from 02.02.2018 so as to reach the office of the West Bengal Police Recruitment Board latest by 04.03.2018 (5 P.M.). NO APPLICATION SHALL BE RECEIVED AFTER THE LAST DATE AND TIME OF SUBMISSION OF APPLICATIONS. HENCE, THE APPLICANTS ARE STRONGLY ADVISED TO SUBMIT THEIR APPLICATIONS WELL IN ADVANCE WITHOUT WAITING FOR LAST DATE AND TIME OF SUBMISSION TO AVOID DELAYED SUBMISSION DUE TO SERVER PROBLEM OR ANY OTHER TECHNICAL FAULTS, INCLUDING POSTAL DELAYS. West Bengal Police Recruitment Board will not take any responsibility for any kind of delays (including postal/applications lost in transit). Hence, applicants should ensure that their applications reach the Board’s Office within the last date & time for receipt of applications. Sub-Inspector/Lady Sub-Inspector of Excise in the Pay Scale of Rs. 7,100 - 37,600/- (i.e. Pay Band-3) + Grade Pay Rs. 3,900/-plus other admissible allowances. Total vacancies as stated above is purely provisional and subject to marginal changes. ii) Shortlisted candidates applying under Exempted Category (E.C.) as a member of the family of Land Losers /Ex-Census Employees/Election Job Workers/Enumerators should produce original copies of Identity Cards showing Registration number issued by the Labour Department, Government of West Bengal at the time of scrutiny before the Personality Test. A.Must be a citizen of India. The candidates must not be less than 20 years and not more than 27 years as on 01.01.2018. Upper age limit shall be relaxable in case of the candidates belonging to the Scheduled Castes, Scheduled Tribes and Other Backward Classes as per the extant rules of the State. A candidate belonging to OBC-A or OBC-B category, if shortlisted for Personality Test, shall produce revalidated/renewed OBC-A / OBC-B certificate issued form the competent authority within 01 (one) year preceding the date of his/her Personality Test during verification of testimonials at the time of Personality Test. C. Educational Qualification :- Must have a bachelor’s degree in any discipline from a recognized university or its equivalent. D. Language : - The applicant must be able to speak, read and write in Bengali/Nepali. The competence of a candidates in Bengali/Nepali language will be tested at the Preliminary Written Test. Note : - The applicants must possess the above noted Qualifications on or before the date of publication of the advertisement. G. Persons with types of disabilities as contemplated under the provisions of the Rights of Persons with Disabilities Act, 2016 (Act 49 of 2016) are not eligible to apply for the posts of Sub-Inspector and Lady Sub-Inspector of Excise. The posts of Sub-Inspector and Lady Sub-Inspector of Excise would be filled up on the basis of qualifying the Preliminary Written Examination which will act as screening examination followed by the Physical Measurement Test (PMT), Physical Efficiency Test (PET), Final Combined Competitive Examination and Personality Test to be conducted by the West Bengal Police Recruitment Board. The Preliminary Written Examination shall be a screening test for selection of candidates for the PMT & PET. The duration of the examination will be 1½ hours. The West Bengal Police Recruitment Board shall be the competent agency to prescribe for minimum cutoff marks for each category and post taking into account the number of vacancies proposed to be filled up in each category and post. The Preliminary Written Examination will either be an OMR based examination or computer based on-line examination (CBT) depending on the number of applicants & other administrative factors. In case of OMR based examination the question paper will be set in two languages (English & Bengali) except the questions on Bengali/Nepali. In case of computer based on-line examination (CBT) there will be a 15 (fifteen) days window preceding the date of Written Examination for mock test/practice. The marks obtained by the candidates in the Preliminary Written Examination shall not be counted for the purpose of determining the final merit list. The syllabus for Preliminary Written Examination shall be as mentioned herein after. There will be NEGATIVE marking for each wrong answer. ¼th of the allotted marks for a particular question will be deducted for each wrong answer. 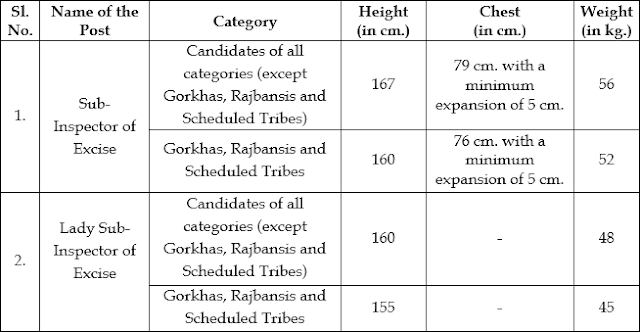 The Physical Measurement Test (PMT) as specified under para 3(E) above relating to height, weight and chest of the candidates qualified in the preliminary written examination shall be taken followed by the Physical Efficiency Test (PET) of the eligible candidates as specified under para 3(F). The candidates qualified in the PMT shall be eligible to appear in the PET. The PMT & PET shall be conducted by the West Bengal Police Recruitment Board. (iii) Paper – III : Bengali/Nepali/Hindi/Urdu for 50 marks of one hour duration. The written examination for all these three papers of the final combined competitive examination shall be held on the same day at selected centres to be decided by the West Bengal Police Recruitment Board. The syllabus for final combined competitive examination shall be as mentioned herein after. A limited number of candidates selected merit wise on the basis of the results of final combined competitive examination will be called on to appear at the personality Test. The final merit list of provisionally selected candidates shall be prepared on the basis of the total marks obtained in the three papers of final combined competitive examination and the marks obtained in the personality test. The West Bengal Police Recruitment Board shall have the discretion to fix qualifying marks in all or any of the three papers and also in the aggregate of three papers in the final combined competitive examination. (iii) Arithmetic : Questions will be set on the basis of syllabus of Madhyamik examination of the West Bengal Board of Secondary Education. (d) Correct use of words, correction of sentences, use of common phrases, synonyms and antonyms. (c) Condensing of a prose passage (summary/precis), (d) Grammar.